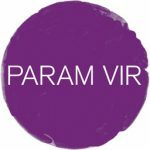 Param Vir connects European modernism with an Eastern sensibility, drawing freely from world mythology, art and literature. Born in Delhi in 1952, he grew up in a family with a background in Indian classical music. In the mid-1980s, he moved to London to study with Peter Maxwell Davies at the Dartington Summer School, and later with Oliver Knussen at the Guildhall School of Music & Drama and at Tanglewood. More recently, he has studied privately with the late Jonathan Harvey and Randolph Coleman. A natural flair for the dramatic intensifies his stage works. Two one-act operas – the witty and compelling Broken Strings, derived from a traditional Buddhist story, and the darkly intense Snatched by the Gods, based on a poem by Tagore – were commissioned by Hans Werner Henze for the 1992 Munich Biennale and staged in a ravishing production by Pierre Audi. Ion, an enchanting full-length operatic treatment of Euripides’ epic yet intimate play, was premiered at the 2000 Aldeburgh Festival and first performed complete by Music Theatre Wales in 2003. Black Feather Rising (2008), a beautiful, spontaneous-sounding music-theatre piece, effectively reworks a Native American legend as an interior dramatic journey for its two main characters. Vir reveals an equally distinctive musical voice in his orchestral works. Before Krishna (1987), an intricate, powerful overture for strings, won the Britten Prize. Horse Tooth White Rock (1994), an inventively scored tone-poem for large-scale forces, based on the life of the 11th-century Tibetan saint Milarepa, was first performed by the BBC Philharmonic conducted by Sir Peter Maxwell Davies. Technically assured and symphonic in scope, The Theatre of Magical Beings was written for the Birmingham Contemporary Music Group in 2003. Between Earth and Sky (2006), premiered by the BBC Symphony Orchestra, captures the timeless, elemental qualities of Anish Kapoor’s Chicago sculpture Cloud Gate. Among notable compositions for smaller forces, the song-cycle for soprano and cellist Wheeling Past the Stars (2007) sets four Tagore poems with exceptional sensitivity. He Begins His Great Trance (2008) is a full choral version of another Tagore poem, ‘Brahma, Vishnu, Shiva’, with vivid allusions to music at its heart. Inspired by the writings of Kim Malthe-Bruun, … beyond the reach of the world … (2009) takes the form of a meditation for solo cello (or cello and percussion) whose resolute opening is counterbalanced by a serene coda. New works include Raga Fields, a concerto for sarod and mixed ensemble commissioned by BCMG, Klangforum Wien and Fulcrum Point, Chicago. A full-length opera in development with a long-standing collaborator, the dramatist David Rudkin, is eagerly awaited. Paul Conway is a freelance writer specialising in contemporary and 20th-century British music. He has reviewed for The Independent and Tempo and contributed to books on John McCabe and Robert Simpson.